The T-17SXL is a compact, ergonomic, pen-driven, SXGA resolution 17-inch LCD display provided with the StarBoard Software suite of presentation and collaboration tools. The T-17SXL raises the bar in tablet presentation technology with a 17-inch LCD display screen that boasts SXGA resolution, excellent color and contrast, and a thin screen that assures natural, accurate operation. Other technological innovations include built-in video pass-through permitting the connection of projectors and computers with the StarBoard system without requiring an external video splitting amplifier. 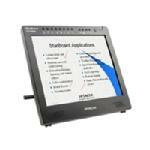 Eight hardware function buttons permit full screen operation without requiring constant use of on-screen menus. The T-17SXL is connected to a standard PC via USB link and comes with a smoothly adjustable tilt stand. Perhaps the most powerful innovation is the inclusion of the latest in the StarBoard suite of professional presentation and collaboration software. StarBoard Software's intuitive, icon-driven interface enables presenters to easily operate in a whiteboard mode or to annotate right over Windows applications or digital video on the display. Collaboration software lets the T-17SXL easily communicate with other StarBoard systems and allows for simultaneous viewing and annotation by multiple systems connected either locally or across the Internet.